The causes of WWII are varied and complex. 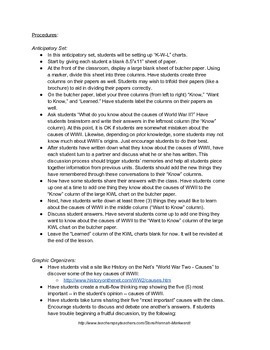 Help students start their exploration of WWII using this lesson plan, in which students use graphic organizers, discussion / debate, and Internet research to begin to understand one of the most important events in human history. 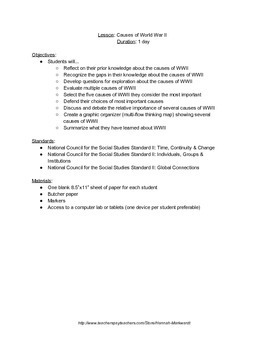 In this lesson, students will evaluate multiple causes of WWII; create a graphic organizer (multi-flow thinking map) showing several causes of WWII; discuss and debate the relative importance of the causes of WWII; and summarize what they have learned about the causes of WWII. 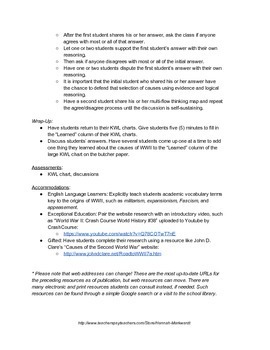 This resource is aligned with the National Council for the Social Studies (NCSS) Standards and includes accommodations for Exceptional Education, English Language Learners, and Gifted students.